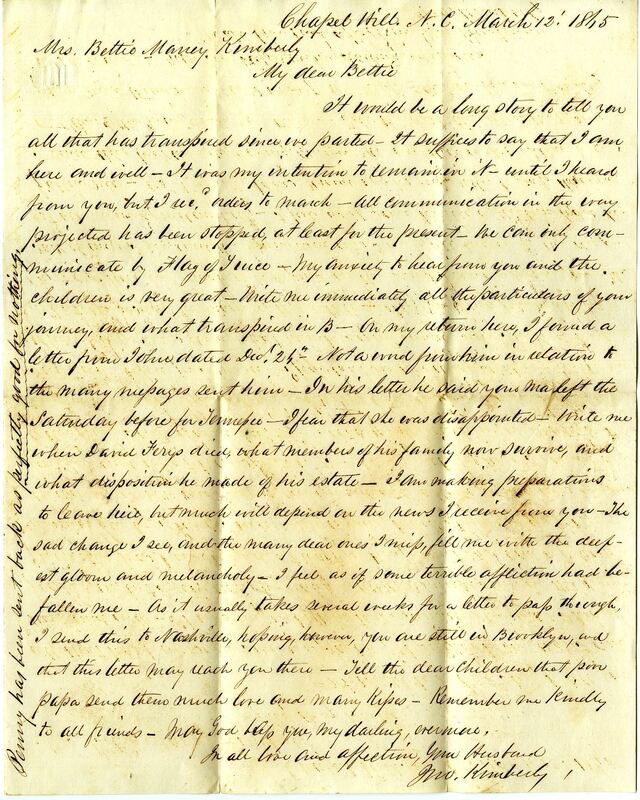 Item Description: Letter written by John Kimberly to his wife Bettie. He writes about the lack of communication to and from Chapel Hill and the resulting sadness he feels from being cut off from his family. He hopes that they are safe in Brooklyn and have not returned to Tennessee. John Kimberly was a professor of chemistry at the University of North Carolina in Chapel Hill, 1857-1864. He was the chair of the agriculture department at the University, 1875-1876. It would be a long story to tell you all that has transpired since we parted- It suffices to say that I am here and well- It was my intention to remain in N- until I heard from you but I rec’d orders to march. All communication in the way projected has been stopped at least for the present- we can only communicate by flag of truce- My anxiety to hear from you and the children is very great- Write me immediately all the particulars of your journey, and what transpired in B- On my return here, I found a letter from John dated Decr. 24th- Not a word from him in relation to the many messages sent him- In his letter he said your ma left the Saturday before for Tennessee- I fear that she was disappointed- Write me when David Freys died, what members of his family now survive, and what disposition he made of his estate- I am making preparations to leave here, but much will depend on the news I receive from you- The sad change I see, and the many dear ones I miss, fill me with the deepest gloom and melancholy- I feel as if some terrible affliction had befallen me- As it usually takes several weeks for a letter to pass through, I send this to Nashville, hoping however, you are still in Brooklyn, and that this letter may reach you there- Tell the dear children that poor papa send them much love and many kisses- Remember me kindly to all friends- May God help you my darling, ever more. Penny has been sent back as perfectly good for nothing. This entry was posted in Southern Historical Collection and tagged Chapel Hill (NC), Civil War, communication, John Kimberly, North Carolina. Bookmark the permalink.